Cardiology patient John Westwood talks about the care he received and his experience at Parkland Medical Center. In this video, David Canes, MD from Lahey Institute of Urology at Parkland, explains how robotic surgery can benefit urologic disorders ONLY based on the surgeon. Learn more in this video. 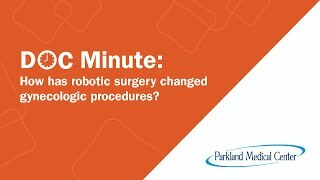 The use of robotic surgery to treat urologic disorders has transformed the field. Find out more in this video with David Canes, MD from Lahey Institute of Urology at Parkland. 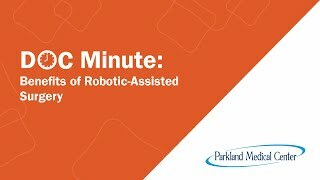 Robotic-Assisted Surgery at Parkland Medical Center - Dr. Mary Fudge, General Surgeon, discusses the benefits of Robotic-Assisted Surgery at Parkland Medical Center. 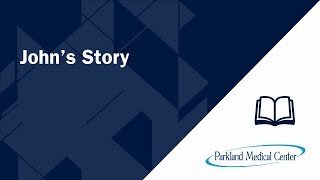 Why do you like working at Parkland Medical Center? Are atrial fibrillation and atrial flutter the same thing? If my heart occasionally skips a beat, do I have arrhythmia? What blood tests are taken in the ER? Why do they give me a wristband in the emergency room (ER)? How effective is screening for lung cancer? Can you talk about the Parkland Urgent Care Center? What is kidney cancer and how is it diagnosed? What is bladder cancer and how is it diagnosed? What are some common urologic disorders? What tests should I have before breast cancer surgery? How can breast cancer be detected in dense breasts? What happens during knee surgery? How does surgery treat degenerative spinal diseases? Why are the different types of spinal injuries? What are the biggest myths about pregnancy?